Have you tried the dhIMG Twitter before? If yes, please consider recommending it by clicking the Facebook "Recommend" button! This download is 100% clean of viruses. It was tested with 25 different antivirus and anti-malware programs and was clean 100% of the time. 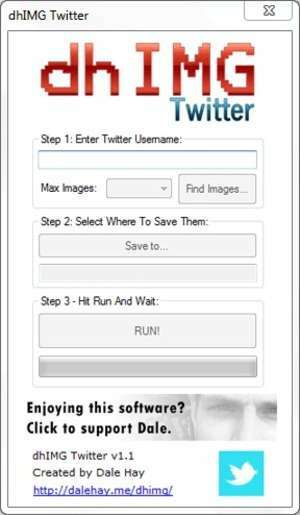 View the full dhIMG Twitter virus and malware test. The file that was tested: dhIMG_Twitter.zip. Tip: If you're experiencing trouble downloading this file, please disable any download managers to dhIMG Twitter you may be using. If you're receiving a 404 File Not Found error, this means the publisher has taken the file offline and has not updated their links with us for DhIMG Twitter. Please do drop us a note in the event of a missing file. Dale Hay provides you with a WinZip/SevenZip Archive file. Installing from Zip files is easy and can usually be done by double clicking the EXE file in the archive with programs like WinZip or Seven Zip. Alternatively, you can extract the setup and installation files to a directory of your choice and run them from there. Download Managers - Download files faster and safer with your Web and Windows applications. Download Managers - Easily locate and download digital images, MP3/WMV music and AVI/WMV/MPG movies! Download Managers - Powerful download manager.